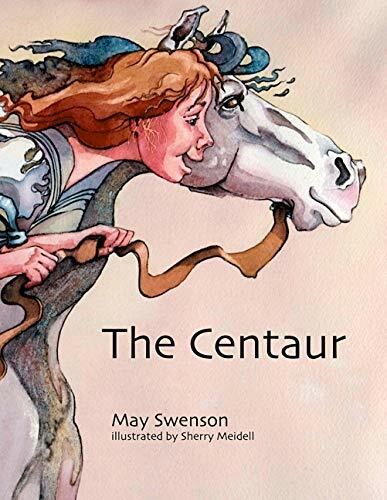 First published in 1956, May Swenson’s "The Centaur" remains one of her most popular and most anthologized poems. This is its first appearance as a picture book for children. In images bright and brisk and tangible, the poet re-creates the joy of riding a stick horse through a small-town summer. We find ourselves, with her, straddling “a long limber horse with . . . a few leaves for a tail,” and pounding through the lovely dust along the path by the old canal. As her shape shifts from child to horse and back, we know exactly what she feels. Sherry Meidell’s water-color illustrations perfectly convey the wit and beauty of May Swenson’s poem. These are playful, satisfying images full of vitality and imagination. Meidell handles the joy of poem’s fantasy and the joy of its occasional naughtiness with equal success. Sherry Meidell lives in West Bountiful, Utah, and coincidentally spent many childhood summers near May Swenson's home. A member of the Society of Children's Book Writers and Illustrators, she specializes in brushes and watercolor with pencil for detail. The Centaur is the ninth book she has illustrated.